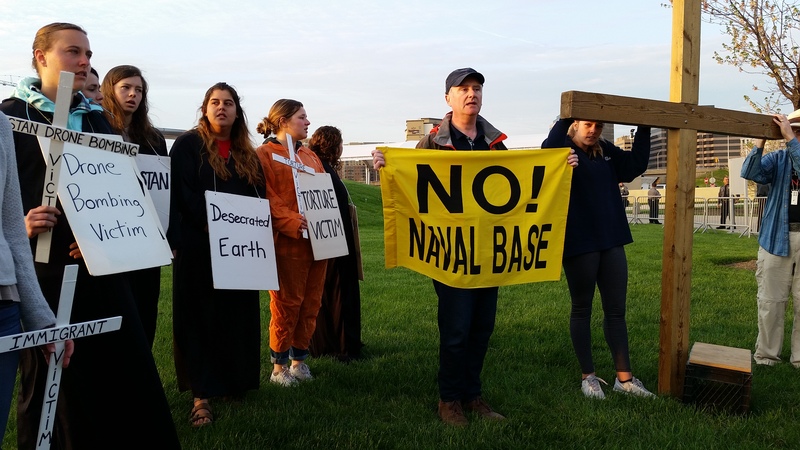 After their quick and wonderful visit to Jonah House, the Loras College students headed to Washington, DC, to participate in the Holy Week Faith and Resistance Retreat, organized by the Dorothy Day Catholic Worker. Like the Loras visits to Jonah House, Loras’s participation in the Faith and Resistance Retreat is a tradition of many years standing. Joe Byrne was able to join the retreat as well. 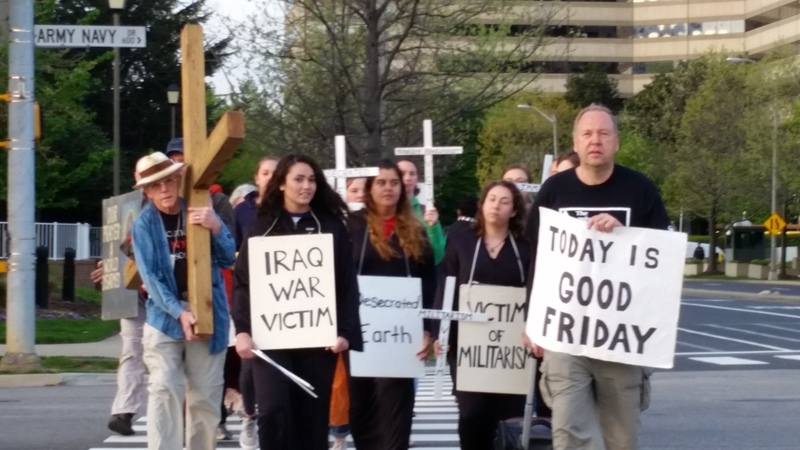 Good Friday began with a vigil at the Pentagon at 7am. This also is a tradition of a few decades standing. 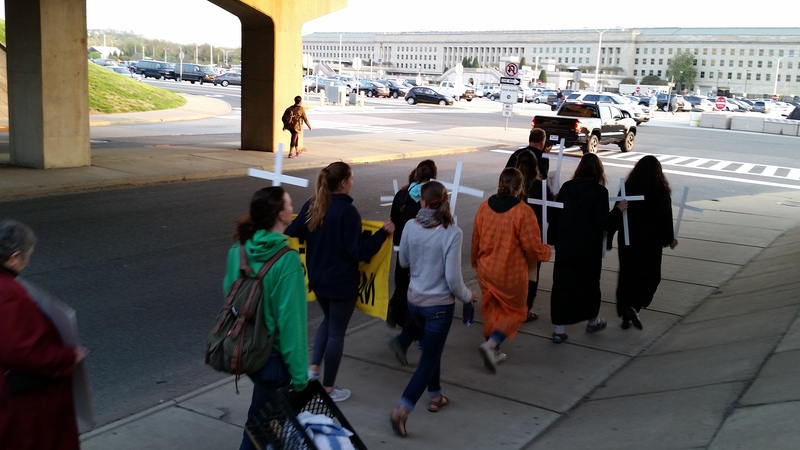 The retreat participants, including the Loras contingent, marched to the Pentagon carrying crosses. 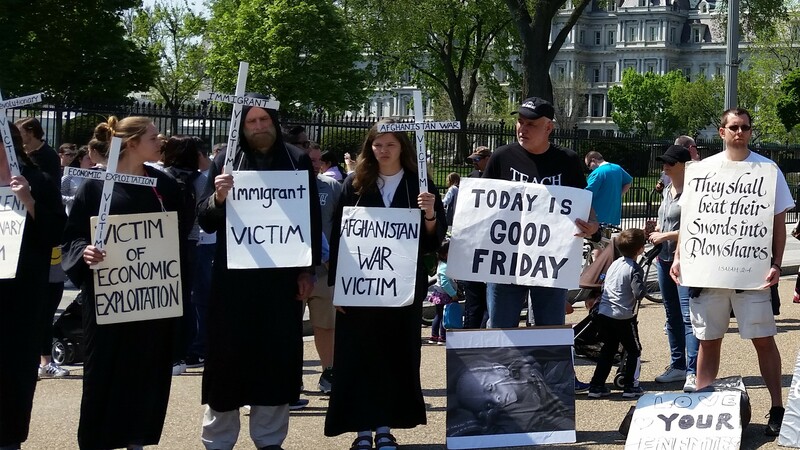 Most of the group filed into the Protest Zone where they did a modified stations of the cross (the reflections of each station are included in Art Laffin’s description). We repeated the stations at the White House later in the day (see below). While folks were in the Protest Zone, four people from the retreat attempted a blockade of the Metro entrance. These four included Joe Byrne. The other three risking arrest were Bill Frankel-Streit, Paul Magno, and Kathy Boylan. 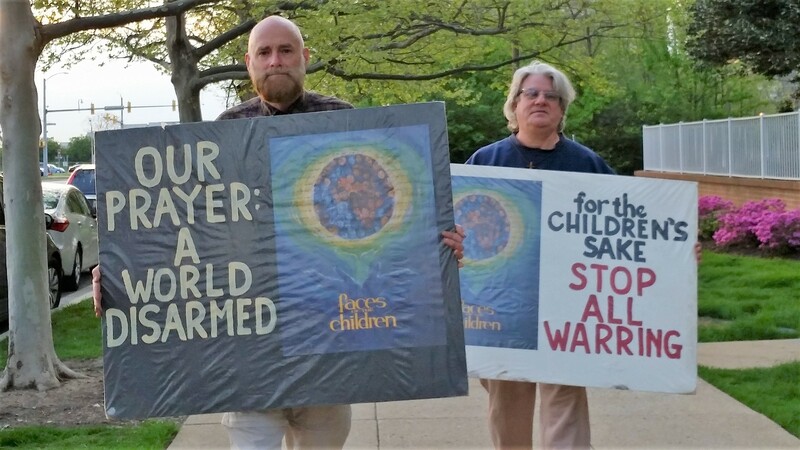 Here is Joe and Paul, with their signs, risking arrest. Those risking arrest are arrested and taken away. 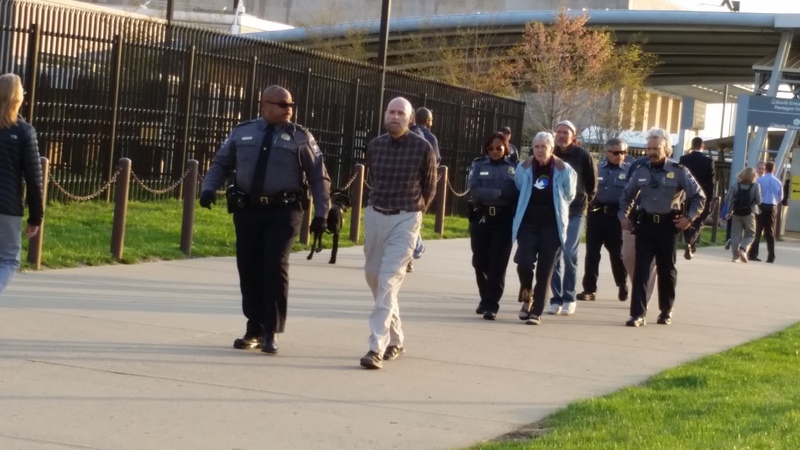 The four people arrested spent a short while in lock up at the Pentagon being processed. They were released with a citation and given a court date. They were able to join the other retreatants for breakfast and to help plan for the noon witness at the White House. 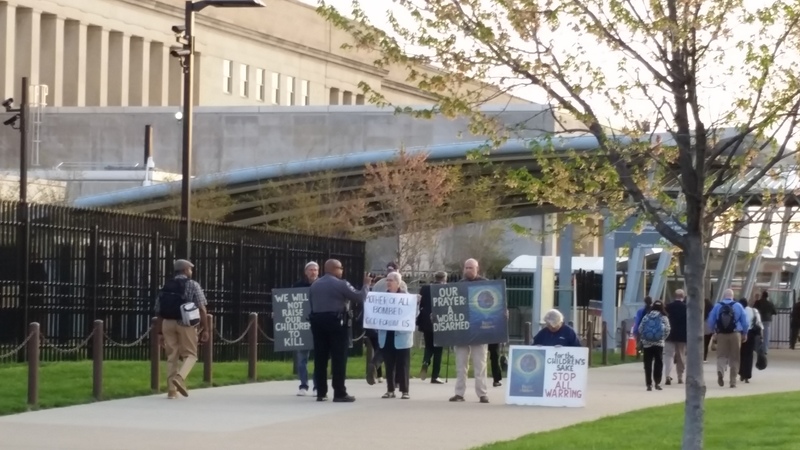 The witness at the White House was similar to that at the Pentagon. There was a dramatization of the stations of the cross, showing those groups who continue to be crucified today. 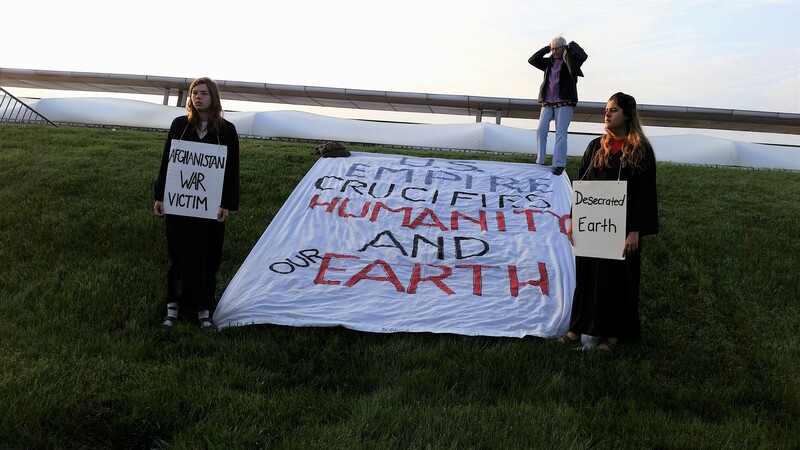 These groups included Iraq and Afghanistan war victims; drone victims; victims of militarism and nuclearism; victims of racial violence, poverty, economic exploitation, torture, and imprisonment; immigrant victim; nonviolent revolutionary victim; and the victim that is our desecrated Earth. 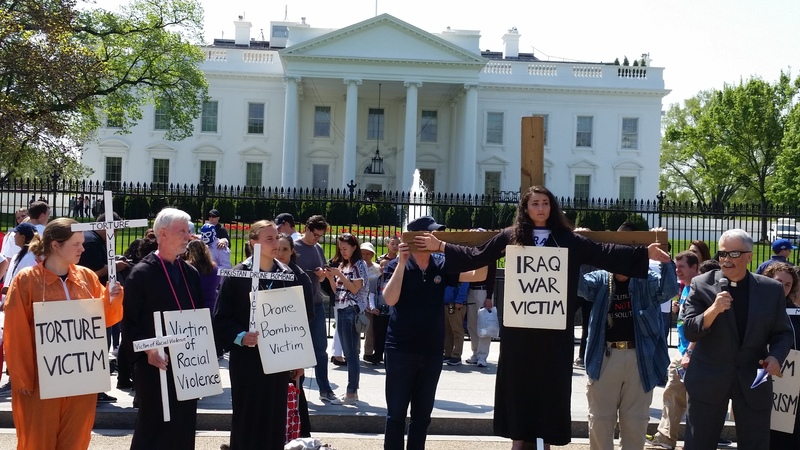 The White House witness ended at 1pm with a final circle with those who participated in the Faith and Resistance Retreat joined by all those who were able to come to the witness at the White House. Shortly thereafter the Loras students were back in the van for the 17-hour trip back to Dubuque, Iowa. We will miss them until they return next year for Holy Week! Thanks to Lin Romano for providing these photos.